EZ DOH's recipe for a fun molding dough is child's play! There are many 'recipes' for making a molding dough that children and people of all ability levels can use to be creative and make shapes with by using their own hands. This recipe, using our EZ DOH hand-crank mixer, enables children to easily and neatly make the dough themselves (which can also be a fun learning process). In this electronic age, it's nice for young people to have an opportunity to make something with their own hands, and enjoy the feeling of creating shapes using their fingers and imaginations. Our recipe calls for simple ingredients, but you can find many other recipes (both edible and inedible) that use similar (but different) ingredients, and different ways to mix the ingredients. 1 package of jello (3 ounce package). We used lime but any flavors/colors will work! To keep things neat, we did everything in our EZ DOH hand-crank mixer (older models with the plastic dough hook may struggle with this heavy dough). Start the process by putting one cup of flour in the mixing container, along with the other dry ingredients (jello, salt, tartar) and the oil. Give it a few turns with the crank and then add in the water and start mixing. It will only take a minute (with a little help from a rubber scraper) to blend everything. Then start adding in the remaining flour (about 1/2 cup at a time) and keep cranking to get a good blend (about 1 minute of cranking every time you add some flour). Of course, the cranking will get more difficult as you proceed, so at the end an adult may need to do the final cranking. Here's how it will look when you're done. This recipe provides plenty of forming dough! https://anytownusa.com/pages/search-results-page?q=eco+dough, which only sells products made in the USA (like EZ DOH). No matter how you go about making or acquiring your molding dough, the main thing is to make something creative and have fun. After you're done playing, keep your dough in a plastic bag so it doesn't dry out (if it does dry out, you can restore it by adding a little water and working it into the dough). These may not be fancy, but you can recognize them! Yes, we do make real maple syrup here in Ohio! The USA produces over 4,000,000 gallons of REAL MAPLE SYRUP annually, with Vermont, New York and Maine leading the nation. Our neighbors in Canada produce even more, and Canada usually produces close to 70% of all the REAL MAPLE SYRUP produced in the world. 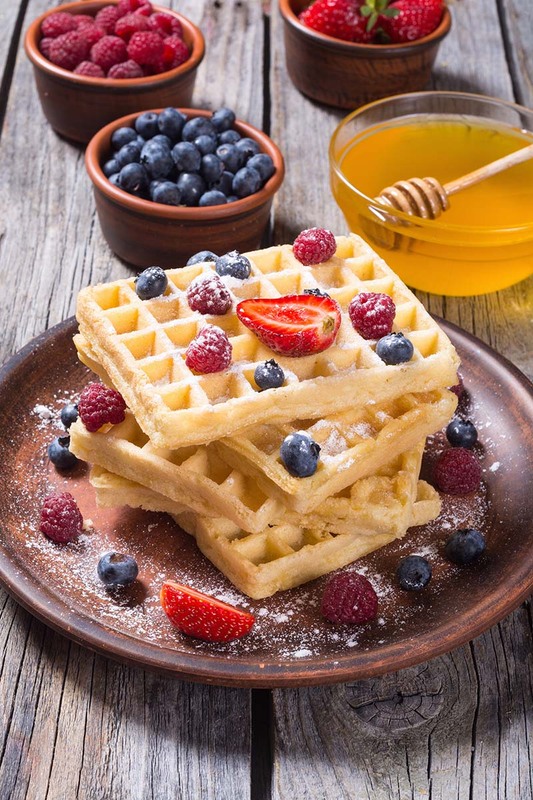 To help make certain this pure and natural product is fully enjoyed, we're featuring a yeasty twist on traditional pancake and waffle recipes. As a bonus, these recipes can be made and refrigerated the night before, so all you need to do is heat up your skillet, griddle, or waffle maker and start cooking while your coffee is brewing (and bacon sure goes well with both pancakes and waffles). Combine 1 cup of flour with the yeast in your EZ DOH container and mix well with a whisk. Combine the milk and water and heat to about 125 degrees. Add this heated liquid to the flour/yeast and mix well with either a whisk or the EZ DOH mixing attachment. Then cover this mixture and let it rise for one hour in a warm spot. While this batter is rising, beat the 2 eggs and melt the butter. Let the butter cool down and then mix these 2 ingredients together. 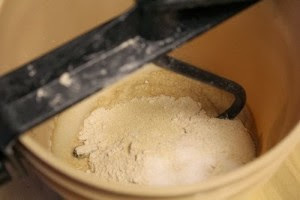 Combine the remaining one cup of flour with the sugar, baking soda, and salt. After the batter has risen, stir it down and add all the other ingredients and mix them thoroughly using the mixing attachment. 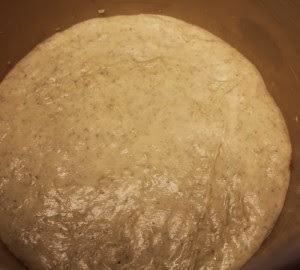 Since this is a batter, there's little resistance (compared to any bread dough) so this can be a safe and fun job for young children and people of any ability level. After a thorough mixing the batter should be smooth. You could certainly go right ahead and make your pancakes now, or as mentioned above refrigerate the batter until the following morning. This recipe should yield 16 pancakes (4 inches in diameter). Note: If you refrigerate the batter overnight, you'll need to add a little milk or water to get the right consistency to the batter. Add blueberries or vanilla or whatever you like to the batter, but don't forget to have butter and maple syrup available for toppings. https://redstaryeast.com/recipes/crispy-yeast-waffles/ . Their website is a great resource for understanding yeast, and they have many wonderful recipes and tips (and pictures like this one). This recipe calls for using frozen blueberries (it is still winter, at least here in Ohio), so you don't need to wait until summer to enjoy this recipe. Make the filling first. Combine the frozen blueberries, sugar and cornstarch in a bowl. Gently toss and let them sit while you prepare the dough (you'll use the 2 TBSP of softened butter later). 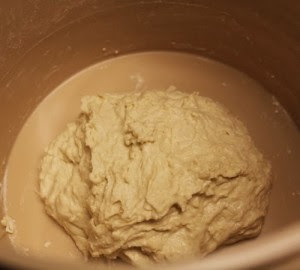 To make the dough, place the yeast in the EZ DOH container and add the warm water and milk. Stir to dissolve the yeast and let that sit for 2 minutes. Add all the rest of the dough ingredients into the container and hand-crank (best to alternatively crank in both directions) for 3-5 minutes. Remove the dough from the container (easiest way is to first remove the entire crank assembly, wiping the dough off the dough hook as you do so). Spray or coat the interior of the container with cooking oil, and put the dough back in the container to let it rise. It's best to cover the container and place it in a warm place to encourage the dough to rise (should take about an hour to double in size). After the dough has risen, roll the dough out on a smooth surface lightly coated with flour. Roll into a large rectangle about 12 x 17 inches in size. Now, spread those 2 TBSP of softened butter evenly onto the rolled-out dough. Then, gently spread the blueberry filling over the dough, and then roll everything up in a 'jelly roll fashion'. Now, cut your dough into 9 or 12 even-sized pieces and place these pieces into a greased 9 x 9 inch baking pan (or something close to that size). This now needs to rise again to roughly double in size, which will take about an hour. If you prefer, let it rise slowly over-night in the refrigerator, and then let it finish rising at room temperature (or warmer) for an hour or so before baking. Bake at 375 degrees for about 23-27 minutes, or until they are golden brown. While this is baking, mix your glaze ingredients, stirring thoroughly to mix in the butter. 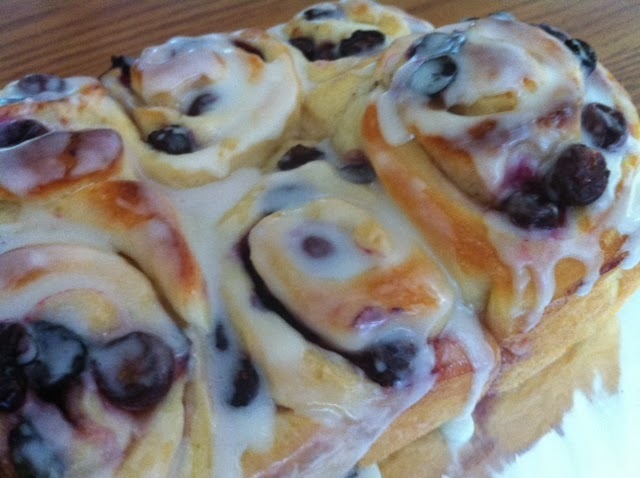 When the rolls are done and have cooled enough, apply the glaze and enjoy your 'winter' blueberry rolls. 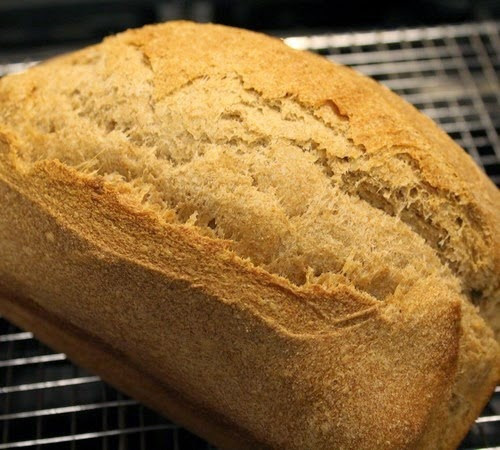 This Crusty Spelt Bread, baked in a loaf pan, utilizes an overnight sponge to help develop the gluten structure and enhance the flavor. I’ve used this method a few times; each time with a different type of flour. For this experiment, I used a mixture of white and whole grain Spelt. Using an overnight sponge helps with gluten development. This is particularly useful when working with ancient grains because they generally have a weaker gluten structure. 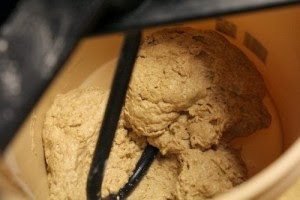 Allowing the final dough to ferment for a longer period of time also aids with gluten development. Due to the weaker protein structure, doughs made with spelt also benefit from a shorter mix. It’s generally better to mix them by hand or utilize a shorter mix on first speed in a stand mixer. Due to these characteristics, I felt this would be a good dough to test in the EZ DOH unit. 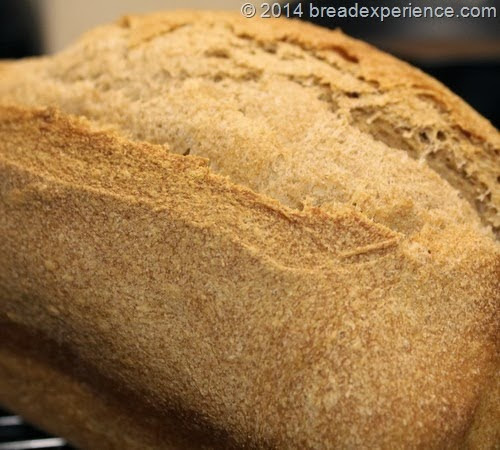 This bread can be baked in a regular loaf pan or as a freeform artisan loaf. I tried it both ways (see photo below). The loaf on the left is made with white and whole grain Spelt. The loaf on the right is made completely with whole grain Spelt and baked on a baking stone using steam. 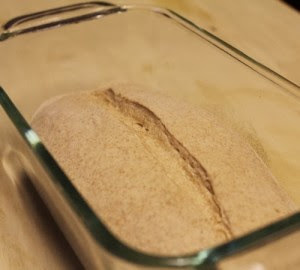 This post documents the process for making Spelt bread in a loaf pan. 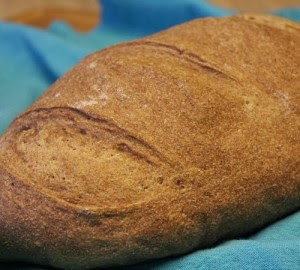 If you want to learn how to bake the hearth-style loaf, refer to the Einkorn Bread made with an Overnight Sponge post. Just substitute Spelt for the Einkorn flour. The dough for this bread was mixed in an EZ DOH manual bread dough mixer, but it could just as easily be mixed in a stand mixer or by hand using a Danish Dough Whisk. Just keep in mind that spelt benefits from a shorter mixing time. Mix the sponge 12 to 15 hours before you plan to make the dough. If the temperature is cooler in the house, then use warmer water, if it is warmer in the house, then use cooler water. Final temperature should be about 65 degrees F.
I mixed the sponge in the EZ DOH unit and let it rest in the unit overnight. After the overnight rest, I added about half the water to break up the sponge. I mixed the sponge and the water for a minute or so, then I added the dry ingredients and starting mixing while I gradually added the rest of the water. I mixed until all of the dry ingredients were incorporated into the dough. Then I removed the handle assembly and kneaded the dough just a bit (in the bucket) with my hands. 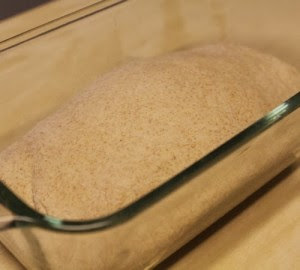 Cover with plastic wrap or a kitchen towel and let the dough bulk ferment for 2 hours total. After 1 hour, fold and turn the dough in the bowl or take it out and perform a fold on the counter or work surface. Place the dough back in the bucket, cover again, and let it bulk ferment for another hour. 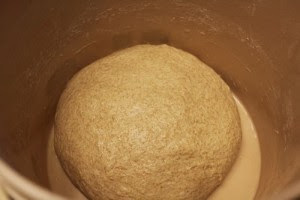 After the 2nd hour, shape the dough into a loaf. Place the loaf seam side down in an 8 1/2” x 4 1/2” loaf pan. I used a glass loaf pan. I scored the loaf before the final proof so it wouldn’t deflate the dough. This is recommended for weaker doughs. It also gives the scores more definition after baking. Let the loaf proof for an hour. It probably won’t double in size during the proof, but the oven spring should be very good. Preheat the oven to 375 degrees F. Bake for 25 to 30 minutes or until a wooden skewer inserted in the middle comes out clean. The crust should be brown and crusty. 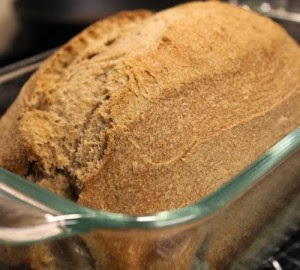 Remove the loaf to a wire rack to cool completely before slicing and serving. The EZ DOH bread maker lives up to its name. It’s really easy to use. I like it although I have found that it does require a bit of hands on kneading. If you’re making breads by hand, this shouldn’t be an issue because you want to get your hands on the dough to make sure it’s developing properly. 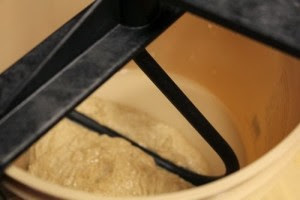 The EZ DOH is a useful tool for mixing no knead breads and for making breads that require a longer fermentation time to develop the gluten. Imagine if you will a salad with your favorite toppings, dressed with your favorite dressing. The only improvement you could make would be to throw in a handful of crunchy, perfectly-flavored croutons. Now, do not wrinkle your foodie nose at that idea! I am not referring to the dry and dusty cubes they put on your salad at the restaurant - things made long ago in a factory and delivered by the food service company in a plastic bag - they are not fit to carry the same name as the delightful croutons we’re about to make. If you have leftover bread - perhaps stale; perhaps from the last recipe you made using your EZ DOH mixer - some good olive oil, a couple of seasonings, and a toaster oven, you have croutons. The bonus: they toast while you make your salad and take ingredients you have on hand. Nothing could be easier or tastier. Flavorings: granulated garlic, herb blends, etc. This isn’t a precise recipe. Making croutons is a process - the French have a verb for it! So you can vary the type of bread, the type of oil (butter for extra-rich croutons on top of a soup would be lovely), and the type of seasonings. Cube the bread and place in a single layer on a toaster oven sheet. Drizzle liberally with olive oil and toss a bit to coat. Season with salt and whatever other flavors you’d like. My go-to, lightning-fast salad crouton recipe is seasoned salt and granulated garlic. Our goal at EZ DOH is to simplify the process of making small batches of dough. Our patented design requires no electricity, has no sharp blades, and makes no loud noises. All the combining, mixing, and rising is done in one container which is light (only 22 ounces) and compact (8"x8"x11"). Enjoy the process of making dough for dinner rolls, pizza, English muffins, pretzels, brioche, breads, desserts, and anything else that uses dough. Our old-fashioned, hand-crank mixer lets children, parents, and grandparents make wholesome and fun recipes together.